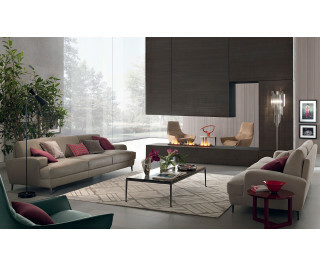 Collection cnsisting of sofas in three different widths: 1900/2300/2700mm. Structure in wood with belts on the seats and armrests and backrests in wooden hollow frame. Padding: base covered in shaped polyurethane foam matched to light velvet. Cushions: seat in polyurethane foam covered with feather layer on upper side and fibre with jersey underneath. Backrests in polyurethane foam covered with fibre with polyester jersey. Covers of cushions, seat and backrest can be removed. Feet in aluminium varnished gun metal.